Posted on Fri, Sep 17, 2010 : 6 a.m. The Michigan football team faces its second team in three weeks from the Northeast. However, UMass is not expected to be as competitive as its neighbor to the south and former FCS school-turned-Big East team, Connecticut. Matt Vautour of the Daily Hampshire Gazette covers UMass football and took a few minutes to chat about the FCS-FBS letter jumble of a matchup taking place Saturday at noon on the Big Ten Network. Q: What's been the feeling around this Massachusetts team this week, especially after James Madison winning last week? Matt Vautour: It seems like a CAA team or two upsets an FBS team every year, but those wins have usually come over lower-level FBS teams - Northwestern, Temple, etc. Virginia Tech is certainly the best team a CAA school has knocked off. That said, I'm not sure how much inspiration UMass really draws from it. I think the players and the coaching staff (are) pretty happy to be 2-0. UMass was picked eighth in the CAA preseason poll coming off a year where it was 5-6, so having a winning record and being ranked seem like significant accomplishments. The UMass fan base is excited about this game because its Michigan, but I think most fans would be happy if the Minutemen can simply avoid getting injured or badly blown out. UMass senior running back John Griffin. Q: What would you say is the biggest strength of this UMass team? Its biggest weakness? MV: Strengths would be running backs and linebackers. 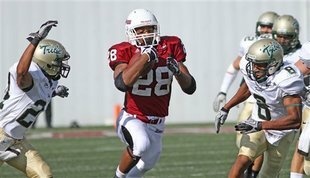 When Northeastern and Hofstra both dropped their football programs, UMass picked up a handful of their former players, including John Griffin. He's a senior running back who rushed for 1,009 yards last year for Northeastern. His arrival has given the Minutemen a nice one-two punch at tailback with Jonathan Hernandez. I think junior linebacker Tyler Holmes is the best overall football player on UMass roster. He makes a ton of tackles most games and has a great knack for being in the right place to make big momentum plays. "The biggest obvious weakness is inexperience. Nobody on the defensive line had ever started a game there before this year, and four of the eight guys that will play are redshirt freshmen. Beyond that, UMass has done a nice job of masking (its) weaknesses so far. But I have a feeling there will be issues that get exposed on Saturday that William & Mary and Holy Cross weren't able to exploit. Q: Can anyone on UMass stop Denard Robinson? MV: Can anyone anywhere stop Denard Robinson? UMass hasn't faced anyone like him in a long time, and it's not like UMass has someone who can replicate what he does in practice. I'm curious to see what sort of scheme the Minutemen will use in an attempt to slow him down. Q: What's the best case/worst case scenario for UMass? In other words, what needs to happen for the Minutemen to win? How does a blowout happen? MV: For UMass to have a chance, it would obviously need to minimize mistakes as much as possible. The Minutemen would need to avoid turnovers of their own and perhaps force a few. UMass needs to be effective on first down on offense to avoid being in long passing downs. A touchdown on defense or special teams would be big as well. They need Michigan to perhaps have a little post-Notre Dame lull and not be as focused or as sharp. After that, they'll need to be a little lucky. A blowout seems more plausible. UMass hasn't faced a good dual-threat quarterback in a while, and if Robinson gets going early, things could unravel fast. The Minutemen can't afford to turn the ball over. Naturally, if they can avoid falling behind early, their confidence goes up. An early hole could drain their belief in their ability to win pretty fast. Q: How much will the Kansas State experience from a year ago help this UMass team? MV: I'm guessing not much. UMass has a lot of players in key spots that didn't play much in that game. Sat, Sep 18, 2010 : 7:21 a.m.
Fri, Sep 17, 2010 : 11:37 p.m. I would expect a lot of run blitzing, with hope that the linebackers and secondary can control the outside. Michigan will react with a lot of short passes into the flats, and maybe Stonum can get deep a couple of times. I don't think Michigan will have trouble getting to 35 points. More a test for the defense. Can the defensive line do enough that the secondary will have help. If the 3-3-5 stack can keep the run in check, UMass will have trouble scoring. I'm going to guess, 38-10, Michigan. Fri, Sep 17, 2010 : 7:29 p.m.
Fri, Sep 17, 2010 : 3:50 p.m.
Fri, Sep 17, 2010 : 2:29 p.m.
Good to finally see a string of positive comments instead of naysayers and trolls. If this team stays healthy and executes, there isn't a team on the schedule they can't beat. You can't tackle what you can't catch. RR and this exciting offense, along with the athletes M attracts are a winning combination. And, with surprising ball control. GO BLUE!! Fri, Sep 17, 2010 : 1:50 p.m. This is going to be an ugly game. I've said it before, I expect Denard to tone it down a bit, no sense in having him get 20-25 carries and 30 throws. He'll probably be out by halftime, to give Gardner/Forcier some reps finally. I was extremely nervous against UConn, since I didn't know what to expect. I knew what to expect against Notre Dame, but I didn't know if we'd win the game. Now, finally, I can relax for a couple weeks. Don't spin me tales of Toledo or Appalachian State, this isn't the conservative, hand-the-ball-up-the-middle Lloyd Carr Michigan team that can occasionally be stymied by inferior competition, or the completely inept Michigan team lacking a QB under a new system. This is a high-flying offensive attack that UMass has no chance of slowing down, nor does Bowling Green. Michigan is 4-0. Fri, Sep 17, 2010 : 1:12 p.m. I think we can do just about whatever we want. The Umass defensive front will not be able to stop us, and our D will be able to fly around without being worried about a mistake here or there. This could be ugly....I'm thinking 45-7. Even worse if RR tries to prove a point. Fri, Sep 17, 2010 : 11 a.m.
Fri, Sep 17, 2010 : 10:52 a.m.
MikeB, I hope the scenario you mentioned in your second paragraph comes true and that U-M had a big enough lead in the 2nd half to let some of the reserves play and gain some experience. Fri, Sep 17, 2010 : 10:51 a.m. I'm glad to hear that their D-line is weak. That plays right into Michigan's strength... the O-line and the run game in general. People will cite that Michigan's RBs have struggled thus far but honestly, no team has tried to take away Denard. Both ND and UMass bought the play-action fake all game long which accounts for why Denard ran the ball 28-29 times in each game. Teams are going to start to look to take away that QB keeper and when they do, the RB lanes are going to open up like Moses and the red sea. Just watch. Fri, Sep 17, 2010 : 9:06 a.m.
Fri, Sep 17, 2010 : 8:20 a.m. I agree, Txmaizeenblue. If I were UMASS, I'd stack the line and try to make Denard pass. However, I think Denard is a good enough passer to take advantage of whatever they give him. If U-M comes to play, it ought to be a 42-14 kind of game for the home team. I just hope they don't take UMASS lightly, or else the Appy State and Toledo memories may return and the bubble will burst on the season. I don't think it will, though. Rich Rod will hopefully have them ready to play a good game. Fri, Sep 17, 2010 : 7:47 a.m.